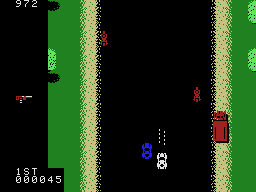 Shoot gangster cars or push them out from the road (or from the bridge! ;) and visit your home-truck (Knight Rider style!) to get more weapons. It´s very nice feeling to push button to drop lots of OIL to road to make enemy cars spin behind!! And ride to boat in the river! Atari ST and Amiga had very good Spy Hunter clone called "Major Motion" in their early days. Arcade´s tune is something really awesome.... ! Yes, Spy Hunter is an all time classic!. Afaik there is a Colecovision official conversion of the game (it seems it is like crap )... perhaps someone out there could make a 'direct' port for MSX?. I forgot to mention that I had the original SPY HUNTER arcade at home, with the gorgeous steering controler, pedals and all. I really enjoyed it! Later, Operation Wolf, Phoenix and others came. At the moment, I only owe an original Scramble arcade by Konami, but I should fix part of the video board. ¡COOOOOOOOOOOL!Got any machine for me? So, are you talking seriously?. Your have the ORIGINAL games with the ORIGINAL cabinets and so...? The dream of all boy, his own arcade room! I HAD (note the past tense) a pletora of original arcade games at home. My father was for a while a salesperson of a little arcade distribution company, and our cellar was a kind of warehouse. Of course, all of my friends and me spent many afternoons right there, playing them till late in the evening. At the moment, I can remember PHOENIX, BLACK TIGER, SILK WORM, OPERATION WOLF, a japanese game with unknown title, PAC-MAN (cocktail mode, not cabinet) and SCRAMBLE. I still owe this one, it was a present of the company director. Haven´t played that coleco version, but it looks like there could be added some more colours in it. Is there a speed-boat in coleco version?